Access and stream your favorite 4K content anywhere, anytime. DS118 supports 10-bit 4K H.265 online transcoding via Video Station and DS video, allowing 4K videos to be converted and played on your computers, mobile devices, or other media players that don't support Ultra HD formats. design Using the same chassis as the DS116 NAS, the DS118 NAS is a compact, low power use, low noise and discreet size. If you are looking for a NAS you cancelled in a cupboard or draw somewhere, this may well be the perfect NAS for you. features The only downside, despite the high performance, is that this is based on the fact it is an ARM processor and therefore will always pale in comparison to a solid x86 based Intel or AMD CPU. Disappointing that PLEX has not yet released supported plex app. 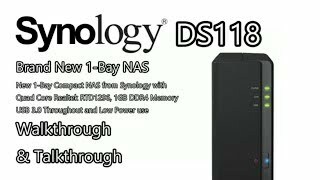 value If you have used NAS in they past, especially a device released this year) then the DS118 will not exactly blow your socks off. For it's size and price tag, it is an excellent NAS, but more designed with first time NAS users, micro users or those on a tight budget in mind. design A Single HDD NAS, as many already know, lacks RAID protection. This should certainly be a factor to take into consideration when considering a NAS to store all your data. If you buy this Synology DiskStation NAS and hard drives we do free build and test for the unit and hard drives. So you can use this device straight out of the box. All free of charge in DS118 price. Lovely little one bay, perfect for backup with the ease of Synology brand know how! Just choose the capacity drive of your choice and you are on a roll. As a backup, a DS118 is great. If you would like to further protect the data, then a 2-bay such as the DS218J or DS218play is a better option, using a RAID-1 (mirror). Transcodes all my videos from Iphone. I have new Iphone 8 with 4k video. No problem. Good price. Listed on Span as supporting Plex and in fact it does not, due to the ARM v8 processor without v7 compatibility. It is true- PLEX have not yet created PLEX server app version for Realtek processor. So if your intentions are to use it as PLEX server, you need to wait little longer until Plex develops an app for it. In meantime you can still use it as 4K transcoding NAS with Video Station app. Plex will struggle even with 1080p transcoding when they will release an app. CPU on its own is not very powerful, but transcoding chip makes it very powerful with Synology own apps. This is revolutionary release! First super budget transcoding device for home! Before you had to get at least ds216play to enjoy video resolution conversion for different mobile devices. So DS116 would let you only stream you media - that way using too much of your WiFi bandwidth. DS118 now will allow you to watch easily your videos when you are on the go using 3G or 4G. H265 and 4K transcoding adds this extra benefit of transcoding videos from new iphone 8 and iphone X videos. Great release.